Isabelle Farm- Owned and operated by Jason and Natalie Condon, Isabelle Farm is a family-run, Certified Organic farm that grows more than 80 varieties of produce and grains on 400 acres in Boulder County. “We love the land we live on and view it as our opportunity to leave a little corner of the world as healthy and biodiverse as possible,” which is why they wholeheartedly agreed to plant an entire hedgerow as a pollinator garden with BBB’s wildflower seeds. Aspen Moon Farm- At this beautiful Boulder-based farm, Owner-Operator Jason Griffith and wife Erin practice Biodynamic farming and old-fashioned holistic methods. Biodynamic farming includes the philosophy that all living systems on the farm are connected (soil fertility, natural plant health, and livestock care), which often produces nutrient and flavor rich goods and a healthy, biodiverse ecosystem on the land (which definitely includes untreated flowers!). Colorado State Beekeepers Association- Beth Conrey, president of the CSBA, has worked tirelessly on pollinator-related issues and solutions. Her accomplishments as an independent beekeeper, such as working to get the Denver International Airport to host beehives and a large pollinator habitat, are what make Beth a great friend, partner, and supporter of BBB Seed. Audobon Rockies- Jamie Weiss, the Habitat Hero Coordinator for the Audobon Rockies chapter, was equally interested in forging a partnership on her like-minded project of increasing habitats to host bio-diverse species on privately owned land. Her mission to educate and provide support to those wishing to start their own pollinator habitats is already wildly successful and BBB Seed is grateful to be a part of that by being one of their seed suppliers. 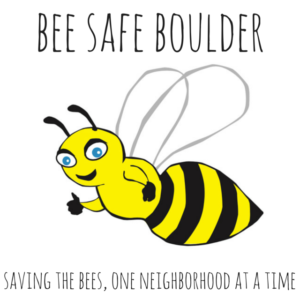 Bee Safe Earth- Bee Safe Earth is the global effort for Bee Safe Boulder. Soon this mission will take over the world. Think pollinator ribbons and bee safe gardens circling our earth… instead of trash and insecticides! Beyond Pesticides- Beyond Pesticides, a national organization started in 1981, seeks to protect healthy air, water, land and food for current and future generations. They accomplish this by forging ties with governments, nonprofits and people who rely on these natural resources and by reducing the need for unnecessary pesticide use and protect public health and the environment. Executive Director Jay Feldman Beyond Pesticides recognizes that clean forage needs to be part of this equation and has thus supported our Plant for Pollinators Project.